I thought that going through the so-called South Road (Manila to Mindanao), a trek of 1, 500 kilometers, via land trip would be a wonderful treat. I have done it previously but I was just a passive participant, a flaccid passenger at that. There was nothing to crow then. But this time around, I am on top. The trip was an exciting game. Well, it was to start with. But while on the road and at the wheel, one realizes, as I have realized, that I was actually treading on a hostile territory after all! First, the roads. The national highway, fanfared as Philippine Pan Highway, is badly bruised. While repair was almost a national activity, there was no apparent effort for re-routing. The motorist is left at the mercy of his blood pressure to fume while waiting in a long cue. I nearly came out to challenge to a duel one fellow motorist who breached the line and tried to counter flow. Prudence dictated that I should merely bite my lips for such transgression. Look at Rolito Go, he succumbed to a three-second road rage and it gave him a full three-decade term in prison! Second, insufficient markings. Roads are not properly marked, well most were not in the first place. The motorist is left at his devise to second guess on which way he would undertake. In addition to resourcefulness, he must learn languages, dialects if you may, so that he would be able to communicate with the natives on which way he was suppose to tread. Chances are he might get the wrong information because of misunderstanding. Had I not used GPS in navigating my travels, I would have ended up in some secluded place where kidnap victims may have been incarcerated before they were ransomed! Third, portions of the highway are constricted. 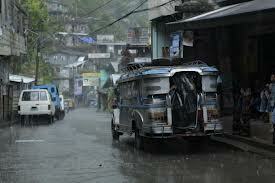 There are areas of the Philippine Pan Highway which were literally alleys or side streets. Worst, there are portions of the national road that virtually cut through market areas, where bicycles, pedicabs, public motorcycles and tricycles cram the pathways, in addition to enterprising vendors who constructed their outlets right on the shoulders of the highway! Fourth, barges ferrying cars from island tip to another are floating rusts! For a car to reach the other side of the highway, the motorist has to professionally park his car on the barge along with giant cargo trucks. If he would be able to manoeuvre correctly, and chances are he would not, his car would not suffer damage at all. Never drive a new one goes the lesson. More so, believe that there is a miracle because if a new Korean ferry can sink, how much more a vintage, rust laden, fledgling ferry to float all the time. Prayers are indeed very relevant when crossing the open sea. Fifth, there is no visible and effective coastal management. Forget the ballyhooed RO-RO program of government. There is nothing worth its fanfare. RO-RO means Roll On, Roll Off for the inter island traveler. Government is nowhere whenever one is travelling in this manner. Just check on the piers. It is filthy, unmaintained, unsupervised properly. The only efficient ground staff manning the areas are the fixers. I am even tempted to nominate a youthful fixer for the annual TOYM because of his audacity in facilitating the ferry ticket for my car and that of others similarly situated. While I enjoyed the pristine beauty of the country side, the thick vegetation, the varied flora and fauna greeting the motorists, the clear blue beaches and unspoiled sea, the flexing climate of humidity and intermittent drizzles, the travel is disturbed by monumental incompetence of road and highway mismanagement. I would even add the terrible sight one gets if stranded in a traffic jam in areas where informal settlers have gathered and whose projections of abject poverty were models for zombie film characterizations. Truly, driving around the countryside through national highway is almost akin to travelling in a hostile environment. Posted on May 17, 2014, in Uncategorized and tagged national highway, Philippine Pan Highway. Bookmark the permalink. Leave a comment.